Tonight I was at the movies with my kids. We were seeing Kung Fu Panda 2 – again – and my wife texted me that Steve Jobs had passed away. I was in complete shock. We all knew he’d been sick for many years but you just don’t think it will happen. Today. And it did. My mother bought our first Mac in 1986. It was a Mac Plus and I still have it in the basement. (I may have to get that bad boy out and fire it up.) At the time I used it to write papers for high school and nothing more. Little did I know the impact that the personal computer would have on my life and to be more specific, the impact that Steve Jobs would have on my life. He single-handedly injected high-tech (personal computing/Internet) into the culture of the world. Technology had been apart of cultural landscape in the form of cars, watches, etc for many years – but he helped us see how high-tech could positively impact our personal lives. 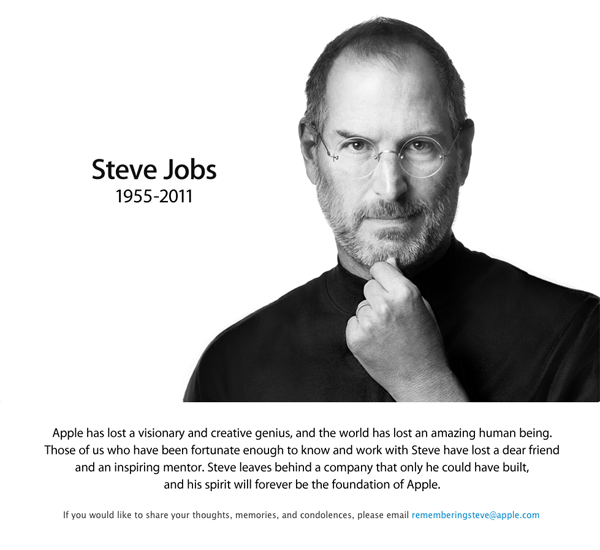 Years later he transformed our lives again with the release of the iPhone and the iPad. As a society we finally realized the promise of personal computing 1)the connection with our peers wherever/whenever we wanted/needed them most, 2) tools to see into and utilize the physical world around us and 3) information, communication and entertainment as an extension of ourselves. He transformed my life and the life of my children. As I sat there in the movie theater, reading tweets about our collective loss, I looked at my children and thought about what their lives would be like without Steve Jobs. How their life would be lesser if it weren’t for his impact. I will miss his passion and innovation.